If you want long hair with lots of volume, consider getting tape-in hair extensions. They’re perfect for someone who wants amazing hair that’ll impress everyone around them. To make it even better, the method is fairly quick and can have amazing results when done by a professional. Tape-in hair extensions are great for some people because they don’t use glues or special tools when they are applied. Instead, a double-sided tape is used. The method of applying the extensions is fairly simple. First, a hair stylist will section your hair. Then, they take one of the extensions and apply the double-sided tape to it. The extension is then placed underneath a section of your hair. After that, the stylist will take another extension with tape on it and place it on top of the same section of hair. This sandwiches your hair between the tape and creates a sturdy bond. There are many benefits to using the tape-in method when getting hair extensions. The first is that the process is fairly quick. Usually it can be done in under an hour, unlike some other methods. Additionally, the extensions also aren’t too hard to remove. They can be taken out with a solution that will dissolve the bonds that they make. One of the greatest things about tape-in extensions, however, has nothing to do with application time, but instead with how it looks and feels. Because the method uses flat tape, when you run your hand over your hair, you won’t feel the extensions at all. This also means that when people look at you, they won’t be able to detect the presence of extensions. Instead, all they’ll see is gorgeous, natural-looking hair. You’ll blow everyone away with how great your hair looks after using tape-in extensions. 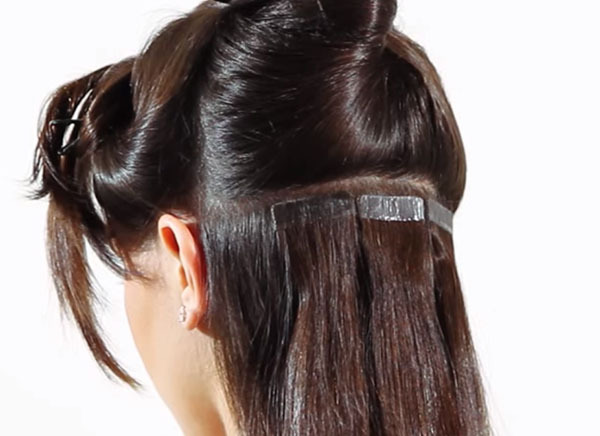 On top of giving you a refreshing look, tape-in extensions are also quite easy to style. You can put your hair up easily. In fact, you can even get the extensions dyed if you wanted. With proper care, tape-in hair extensions can last you 2-3 months. To keep them looking nice and natural, some maintenance is required. You should brush your hair several times a day to avoid tangles, and make sure to wash the extensions thoroughly. If you move a lot in your sleep, it might be a good idea to put your hair in a ponytail or braid before bed. If you keep the extensions clean and tangle-free, it will be better for your natural hair and make it so that the extensions can be used again.